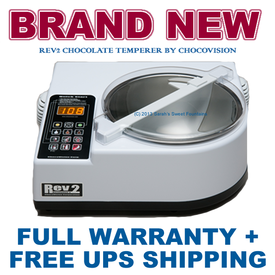 If you have been thinking about purchasing a Rev2 chocolate tempering machine, NOW IS THE TIME! The manufacturer just announced a SIGNIFICANT price increase on the Rev2 effective Monday, November 4, 2013. Please place your order NOW to ensure you get the lowest price!! Orders placed on or after November 4, 2013 WILL be at the higher price!! Please note ALL machines will see a slight increase at this time, but the increase for the Rev2 is MAJOR, so please do not delay!! This is NOT a sales ploy, the manufacturer made a decision to raise prices and we truly want to make sure our valued customers get the best possible price! !